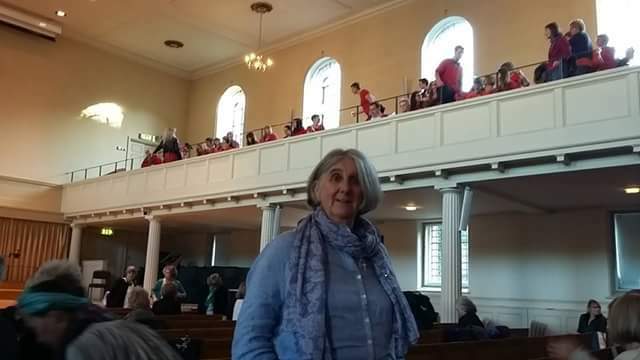 One year ago I told you about my Macapello Choir at a singing day at a big Choir Convention in Bristol, I cannot believe a year has passed but then it has been a challenging year. 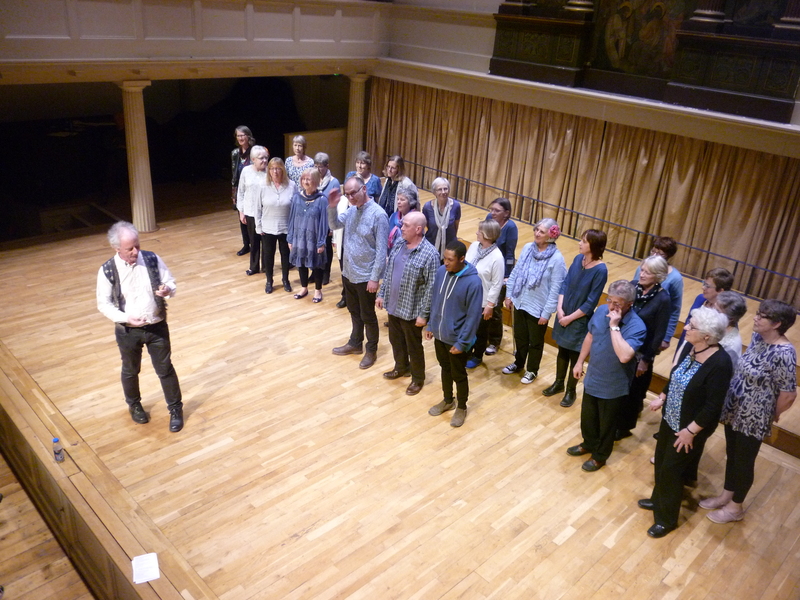 Macapello Choir’s latest performance was on Sunday 9th April 2017 at this year’s Choir Convention. Some of you may remember reading about last year’s Convention where we performed the song we had written ourselves, When Will I See the Sun. This year we managed to be slightly different to all the other choirs by walking onto the stage singing, yes singing and walking! Risky!! We performed four songs in total. First walking on, two songs whilst on the stage, the fourth as we walked off again, singing! Wow despite our reservations it went down a storm! The Convention brings together 16 choirs from the south west of England for a day’s singing. The first part of the day consists of combined singing, about 500 people together, in four part harmonies. 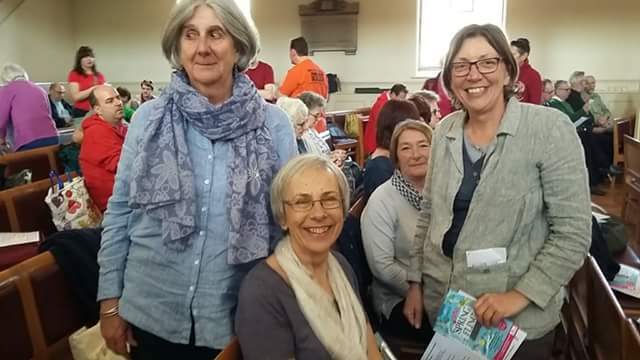 We learn the songs on the day so it is always fun and a great way to meet new people. We have a lunch break then same format applies. Four experience musicians lead the day but in the evening each choir performs a variety of songs. Some choirs were ambitious this year which added to our anxiety levels. 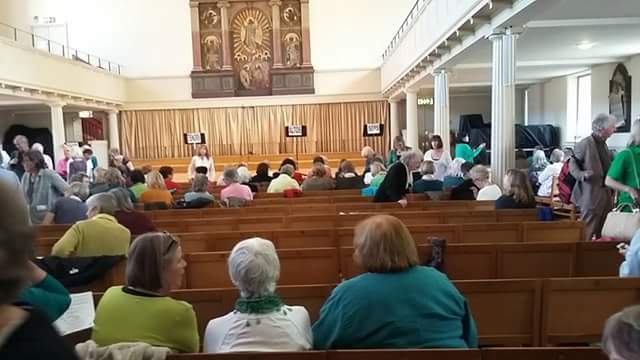 One large choir performed a piece by Bruckner another a piece by Elgar, this is the level of choral societies rather than community choirs so we were suitable impressed. One group sang a tribute to David Bowie, other performances range from Gospel through Swing to Classical. Standards vary of course but everyone is enthusiastic and enjoy the performance. Accolades from one’s peers always feel special. We had to wait until the second half to perform our songs again making us nervous. The adrenaline kicks in once we start but our leaders keep reminding us to breath, smile, relax, focus – all at the same time! We began with Well I woke up this morning with my mind set on Freedom … a lively, uplifting gospel song. We settled ourselves down then sang Your Children which I have told you about before. Next was our ambitious Far Over the Misty Mountains Cold one of the themes from the film The Hobbit. The Basses have the lead in this and as we only had 3 we were apprehensive, especially the three guys! Well, we earned a standing ovation. In shock we walked off the stage singing Famba Naye a rousing African song which many of the audience knew so they sang along with us. We managed to keep within the time limit – just – 8 minutes for the whole thing! Our choir leaders Dave and Lisa were over the moon as the other choir leaders congratulated them on our achievement. Sadly I’m not able to share all the sound files. What a night! We sang on the coach home although we were exhausted. I love being in my choir as many of you know but an occasion like this makes me feel so proud of a group of people of all ages (top heavy on over 50’s at moment! ), backgrounds and skill levels who come together to make such wonderful music. The venue is beautiful with great acoustics.